Do you ever have those days where you to not see the light of day, as in you do not leave your house? Not because you are sick or can’t, you just choose not to. Yesterday was one of those days for me. I did, however, force myself to get out and stop by Pier 1 in the evening to see if there were any good Halloween decorations left. After that I came home and online shopped at JCrew. Sure, I could have gone to the store, but no need. And really, have you seen the new clothing updated at JCrew? Why buy a $500 couture shirt when there are $68 shirts at JCrew that look great? That is what I say at least. And I opted for some big floral prints. With a busy outfit, your handbag has to be completely simple and toned down. Avoid prints and busy combinations of materials. That seems obvious. But you should also avoid too many pockets, buckles, and outside adornments when pairing a bag with a busy outfit. I haven’t loved a Fendi bag in quite some time. And I was hoping this bag would change my mind on Fendi, but it is unimaginative to me. 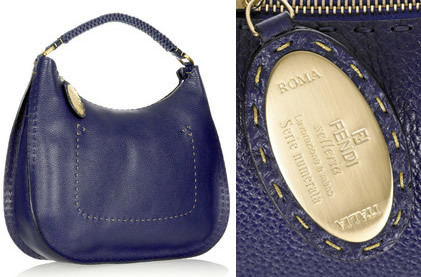 The Fendi Selleria Hobo Shoulder Bag at least gives a bland palette, only sporting navy leather with contrast topstitching. I do love the gold hardware which really offsets the navy leather. There is also a woven shoulder strap and top zip. What do you think, too bland or just right? Buy through Net A Porter for $1560. P.S. I realize that Shannon already covered this bag, but I wanted to give a different take on this bag!